Landscapist Sylvester Shchedrin was the son of the famous sculptor Theodosius Shchedrin and the nephew of the landscape painter Semyon Shchedrin. Sylvester grew up in an atmosphere of artistic interests, from childhood knew the collections of the Hermitage. In 1800 Shchedrin entered the Academy of Arts. Being a diligent student of the Academy, he was given the task of portraying a sea city or village and successfully coped with the task. He created a classic landscape where three planes were clearly visible, a wise balance, but there was a complete absence of air and would take the time of the day. For this work he received the Gold Medal and was sent to Italy to write classical landscapes and study antiquities. During these years Kiprensky, Bryullov and many other Russian artists lived here, met, in particular, at the music evenings of Zinaida Volkonskaya. Shchedrin worked hard. At first, his landscapes, according to the classical tradition, were depicted by famous antique monuments and historical places, such as the “View of the Coliseum”. But Shchedrin unexpectedly discovered for himself another Italy: Italy inhabited by man coves and coastal rocks, Italy simple toilers, sailors, fishermen, street vendors. He was known and loved by ordinary people in many Italian cities, and he wrote these people and his endless sketches. The Russian artist saw the Italian landscape not with the eyes of a tourist looking for exotic beauty, but with the eyes of an Italian fisherman or peasant, for whom nature is a habitable home. One such work is the picture “Veranda wrapped in grapes”. Looking at it, we see two lumens framed by a lace of foliage, and a dazzling glitter of the sea. And only then we notice the life hovering in the shadow from the heavy midday heat. This is the hour of the afternoon rest, when everything stops in the south. A fisherman in white clothes and a red cap is sitting on the parapet, next to him is a boy in a wide-brimmed straw hat. Right on the floor, the old man is dozing. It is worth paying attention to the foliage of the grapes – we will not see two strokes of the same color next to each other. The leaf is yellowed, the leaf is bright green, the leaf is reddish, the leaf is brown, and all this mass of colored foliage is permeated with sun rays. The painter constantly changed brushes, mixed colors. If, forgetting or tired, he would put several identical smears alongside, in the picture it would turn out to be a “dead spot”, and this is unacceptable, since everything in nature lives, changes the color every minute. Later, Shchedrin’s work acquired ever greater simplicity and immediacy in the choice of subjects and in the transfer of nature and urban species. Loved the embankment, as well as other types of the city, Shchedrin wrote many times in the daylight and moonlight. In the summer, the artist worked in Sorrento, landscapes of the late 20’s. with views of this place, especially its harbors, are available in the Tretyakov Gallery and the Russian Museum. Sylvester Shchedrin opened new receptions, brought to the landscape the sun, the wind, the glitter of the sea, the moist, sea-smelling air. His “landscape foot” stepped from the dry classical landscape into a living life. 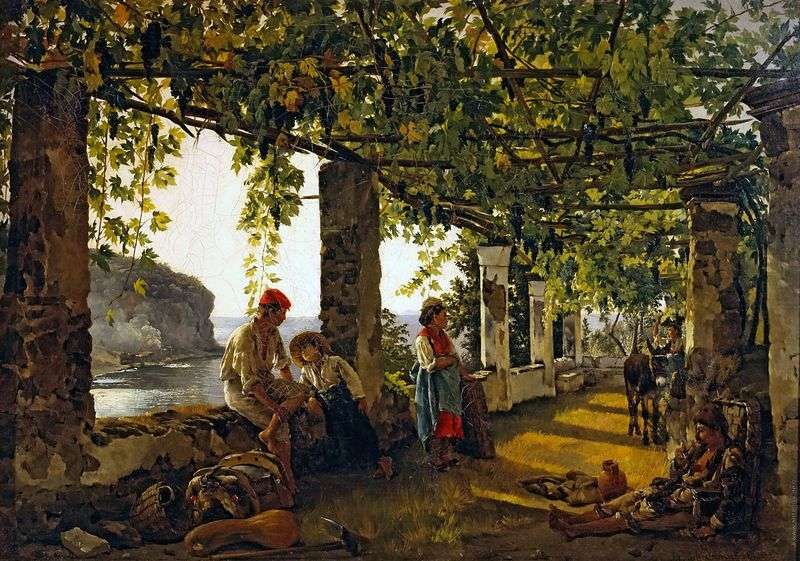 Description and meaning of the painting A veranda wrapped in grapes by Sylvester Shchedrin.